■ The role of laparoscopy in pediatric urology is, at present, limited. The ability to perform major abdominal surgery through small-sized open surgical incisions has resulted in limited application of laparoscopy in pediatric urology. Incisions measuring 5-10 mm for each port site are rather large in the pediatric population. Utilization of minilaparoscopic instrumentation in this scenario would be cosmetically advantageous and also would afford appropriate handling of delicate pediatric tissues. ■ Performance of fine reconstructive laparoscopic procedures will require the development of finer instruments, in the minilaparoscopic range. 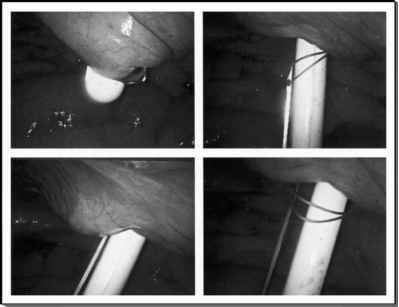 ■ Continued development of minilaparoscopic technology and growing laparoscopic experience are likely to result in more widespread application of minilaparoscopy, either exclusively or in conjunction with conventional and robotic laparoscopic procedures to provide increased precision during laparoscopic tissue reconstruction and to improve cosmetic outcomes.